While you're waiting for your Tesla Model 3, you can get a ballpark idea of what your monthly Model 3 budget might be using Ben Sullins' online calculator. Sullins new cost estimator not only lets you figure out the price of your Model 3 and then deal with how much per month you will be paying on the loan, it also now includes charging and insurance costs. As Ben explains, he's getting a ton of feedback on the tool and continually updating it. He's even included a currency converter. When configuring your Model 3, the estimator gives you choices, including range (battery size), color, wheels, Premium upgrade, and Autopilot. Ben has added his U.S. federal tax credit estimator as well so you can get an idea when the incentive might expire and how much of a rebate you may expect to receive. Check it out and let us know what you think? What's your Model 3 going to cost? 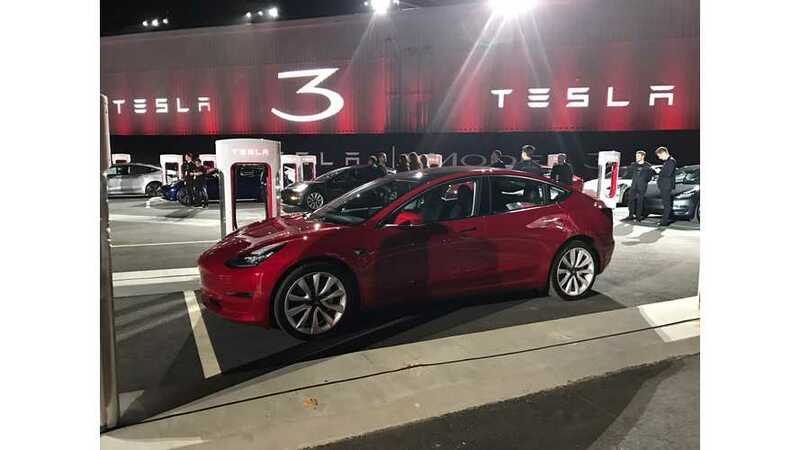 How much will your Tesla Model 3 cost per month? I built a tool to help you calculate exactly that. This tool calculates monthly cost of owning a Model 3 including price, taxes, fees, loan interest and monthly charging costs (link at the bottom of the page). There are some important notes about how the Tesla Model 3 Cost Calculator works so make sure to leave me any questions you have below after watching the video. A couple weeks ago I published my first version of this Tesla Model 3 Price Calculator that showed what your overall cost would be for a Tesla Model 3. Since then I’ve had almost 100K of you use that tool and I’ve received tons of feedback. A big question left unanswered with the previous version was what the monthly charging costs would be. This lead me down a path to build a calculator specifically for that. Along the way, I realized that I should instead make this new calculator more comprehensive so I went back to the drawing board. So I built a monthly charging calculator for a Tesla Model 3. First, you need to configure your Tesla Model 3 with the upgrades you want, color and wheel choices, as well as your tax rate and doc fees. If you’re in the US, these will auto-populate. If you’re outside the US, you’ll want to update these to match your location. Next, you’ll need to enter your loan information. Here I’ve calculated the taxes and fees in addition to the purchase price of the car and auto-filled that as your loan amount. You'll want to update this if you don't plan on financing the full amount of your Tesla Model 3. I’ve also defaulted it to the typical five-year loan term and the current 4.5% interest rate we’re seeing the US. If either of those doesn't match your situation, you’ll want to update before continuing. From there I need to know your driving habits to calculate your monthly charging cost. I’m assuming here you’re charging at home with a 240v NEMA 14-50 outlet. There are other options, but for this, I wanted to keep it simple. I’m also not factoring in any free supercharging Tesla may offer since we don’t know those details at this point. Your driving style also affects the amount of energy your Tesla’s efficiency so if you tend to have a heavy foot when driving you’ll want to update that. Next, I wanted to include a monthly insurance cost and any incentives you may receive. Since Insurance prices can vary widely depending on your location and situation, I defaulted it to $120 per month. Feel free to update if you have a better estimate. And lastly, I have a field here for any incentives. This is last because most likely this won’t affect the monthly cost. Let me explain…. In the US, the federal tax credit only reduces your tax liability, that is, how much you owe to the government. The IRS isn’t going to write you a check here though. So if you make less than about 50,000 USD, you’ll likely not be able to take full advantage of the credit. Since the credit is applied when you pay taxes, the following year, it won't affect the purchase price of the vehicle nor will it affect the monthly payment. In fact, when researching I couldn’t find many examples where any incentives offered reduced the purchase price of the vehicle. This is why I include the incentives at the end, to give you a “net cost” of your Tesla Model 3, even though it doesn’t change your monthly cost. Once you’ve made all your choices it’s time to see the results, click the big button there and get a breakdown of your Monthly Costs, Charging Details, and Net Costs of owning a Tesla Model 3. I’m still working on making this better so if you have ideas for how to improve, please let me know down below. Enjoy!